Here's something fun for a Friday. 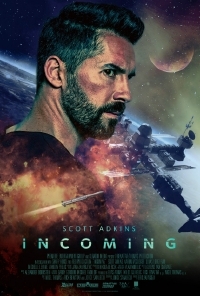 A trailer has appeared for a sci-fi indie called Incoming starring Scott Adkins. That's right, Scott Adkins is going to space. Directed by Eric Zaragoza the film co-stars Aaron McCusker, Alaa Safi, Michelle Lehane and Dominic Power. The International Space Station is now a prison -- the ultimate black site. No one's getting out. And no one knows it's there. But when the imprisoned terrorists take over the Station and turn it into a missile aimed at Moscow, only a shuttle pilot and a rookie doctor can stop them. Their task is complicated by a rogue CIA agent (Scott Adkins) who has his own plans for the station and the terrorists within. Incoming will be available May 4, 2018. Check out the trailer, exclusive to ScreenAnarchy.